Here we are shifting into summer, are you ready?.... One of my favorite things to do when getting our home summer-ready is to address the small details to make it feel relaxed and refreshed. Color, texture, art, fresh flowers and greenery are some of my favorite ways to update our home for summer. Today I want to share a few DIY projects and decorating solutions to help you create a comfortable and colorful summer home that you can enjoy throughout the season. I'm a coastal girl, eastern Long Island to be exact so it's no wonder why I love the beach. When I'm not working you can find me on our boat or walking along the ocean's edge snapping pictures. 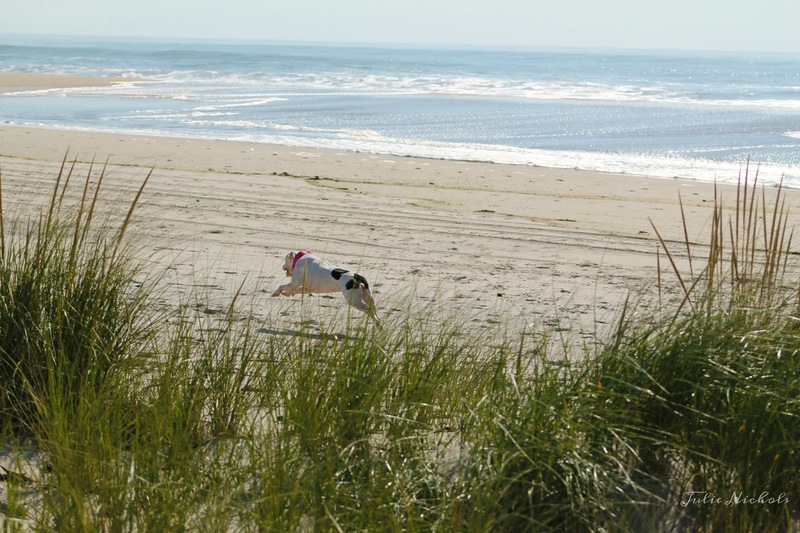 It turns out our rescue dog B happens to love the beach too! I like to add textures, colors and natural elements that mimic how the seasons make me feel. For summer I set the tone by using natural woven textures, flowers, and bright colors that give off a casual, welcoming vibe. The colors in my photograph represent what I use in our home. 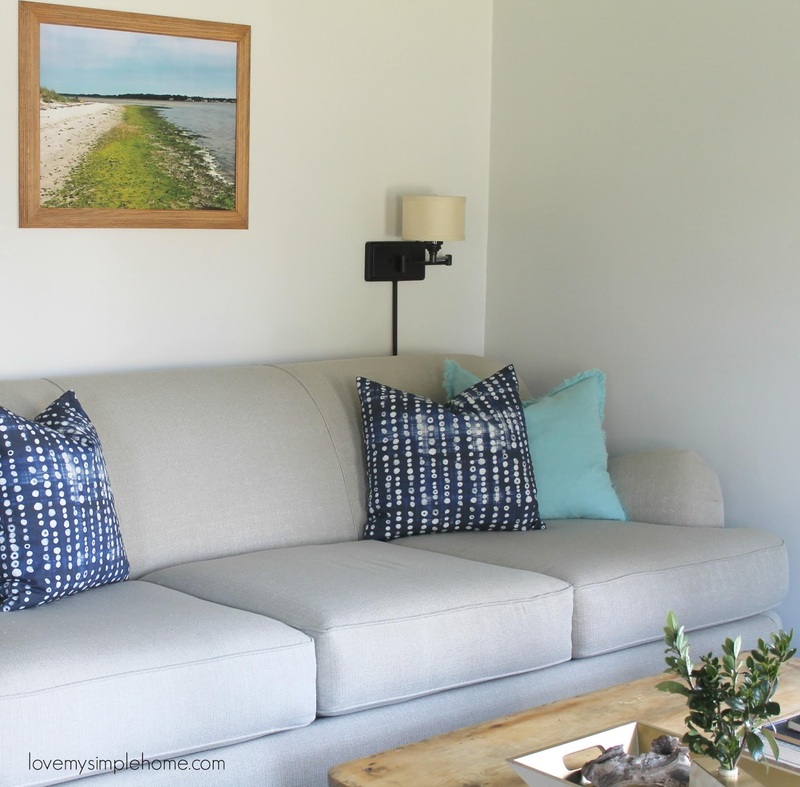 Join me for a walk along the shoreline and spend a lazy day catching rays and a whole lot of passion talking about solutions for a relaxing and colorful summer home. Grab your sunhat and let's get started. Bring in the sunshine: To let in maximum light and views go for minimal window treatments, or if privacy isn't a concern go with none. Swap out heavy curtains for seagrass shades and as this may seem obvious, clean windows make a big difference in light quality, so give them a scrub. In our living room, I updated our windows by swapping out verticle blinds with textured roller shades and added curtains in a creamy color. Give a tired table or desk new life using chalk paint in a summery hue, such as blue or a minty green. 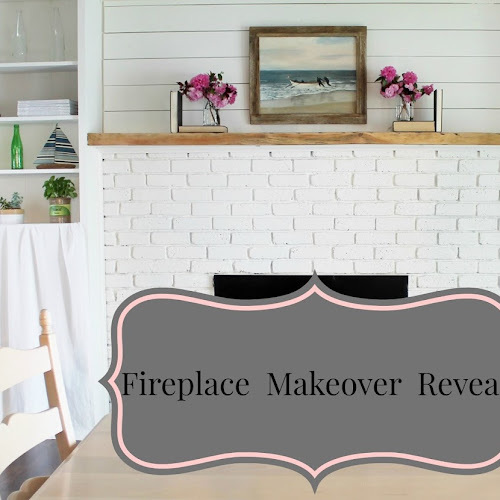 The chalk paint creates a fun look and gives an old piece a fresh and modern edge. The great thing about chalk paint is it dries quickly and you don't have to prime. Which means more time at the beach and less time painting. If you would like to read the tutorial on how I painted this desk click HERE. Swap out art: Get your photos out of your camera! 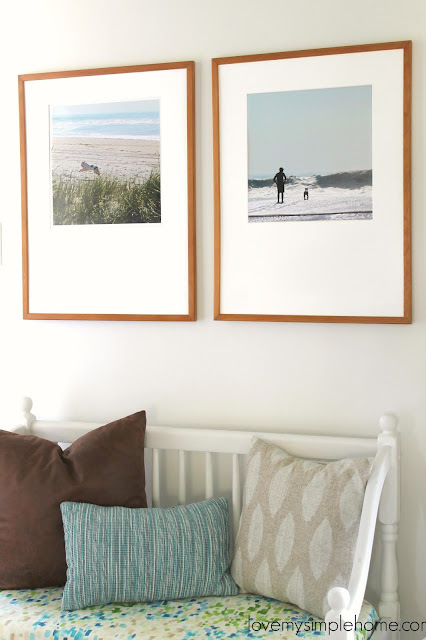 Print your digital photographs and frame them! 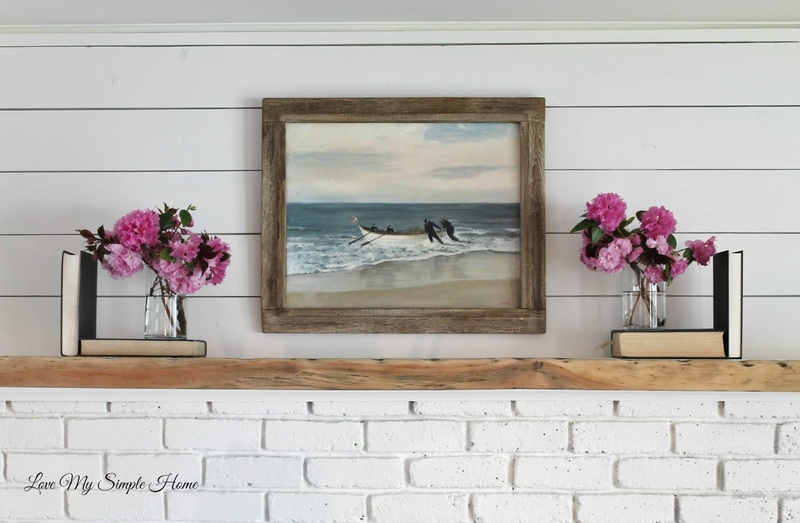 Framing your own photographs in large frames makes a big statement on a small wall. I purchased the two frames below including the square mats at a local thrift store. Use your printer to print them or send them out to a professional. This is the least expensive way to get art on your walls. Another affordable way to brighten a blank wall is with colorful art pieces. 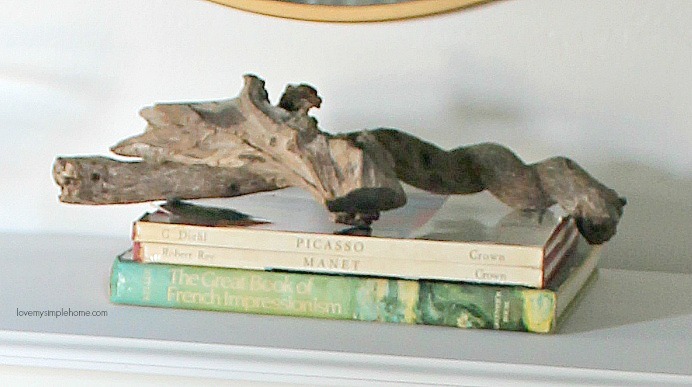 Affordable pieces can be found just about anywhere online or at thrift stores. One large photograph or a collection of smaller ones also provides the perfect blank-wall solution. If you like to DIY, make your own art using nautical maps like the one I made below. Can you believe the frame was a cabinet door? I styled this picture using three metal race boats that were once trophies. Bright prints on pillows, for example, can instantly lift a room's mood - and yours. To allow the motif to truly shine, keep the wall color neutral and other accessories to a minimum. Bring bright summery colors into your home with freshly picked flowers. Create a relaxing arrangement by placing clippings in bottles. Small clusters of one bright color look cheery and create an undeniable relaxing summertime vibe. For a crisp clean look add a few clippings of greenery to a vase. Texture: Natural woven materials never fail to make a room feel like a summer day. A basket filled with driftwood or woven hats are simple ways to add texture to your summer decor. Area rugs in sisal or jute also add texture. 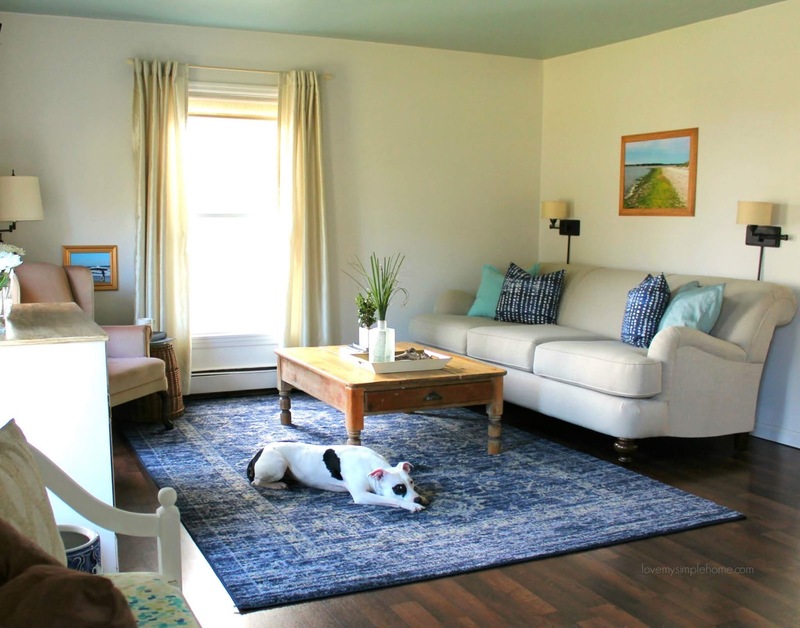 The care for a jute rug is easy, simply shake out the rug to remove any sand and debris that may settle into the fibers and rotate the rug to equalize wear. Now that you've gotten your feet wet and sand between your toes, I hope you are feeling that summer vibe and the desire to create your own summer home.